Liona Manuel graduated with Honours in Biochemistry at McMaster University, with a minor in music. Due to her strong belief in the naturopathic philosophy and her passion to assist and empower others towards health, Liona decided to pursue her medical training in Naturopathic Medicine from the Canadian College of Naturopathic Medicine in Toronto, Ontario. Liona is a licensed Naturopathic Doctor with the College of Naturopathic Doctors of Alberta (CNDA), a member of the Canadian Association of Naturopathic Doctors (CAND), and a member of the Alberta Association of Naturopathic Doctors (AAND). 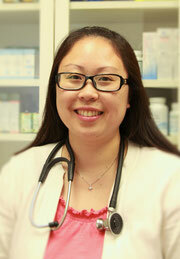 She is also certified in Parenteral Therapy, Darkfield Microscopy, Injection Therapy and Chelation Therapy. Liona also has a vast knowledge in natural health products from her past roles with Body and Mind (the professional dispensary of the Canadian College of Naturopathic Medicine). In addition to general family practice, Liona has a special interest in diabetes, cancer, and other chronic and autoimmune disorders. Liona currently has her own private practice at two locations, Airdrie and Vegreville, Alberta, and is now accepting new patients.